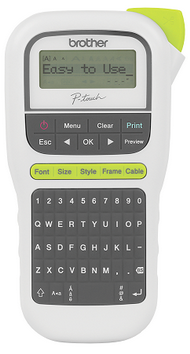 Being more efficient and better organised is easy with the PT-H110, which delivers professional-looking laminated labels at the touch of a button. Offering 10 font styles and a wide range of symbols, the PT-H110 also lets you design creative labels through the Deco Mode feature. You can personalise your labels by adding a frame, and even preview your work before you print.